Publisher and Details Published by RAK, PO Box 35, 170 08 Prague 7, Czech Republic. Available from specialist book dealers by the time you read this. Published in the usual Landscape format of this publisher and on very high quality gloss paper. It has 74 pages crammed full of 166 colour photographs, with 68 black and white and 6 pages of 1/72 scale plans, also 59 sketch drawings and 6 colour artwork illustrations. The Text is fully bilingual and is kept to a bare minimum. There is one main page of history and the rest is in the form of captions. Gunner / Radio compartment, Bomb bay, Main legs, Tail wheel. The detail and careful selection of photographs enhanced by the superb sketch drawings leave no section uncovered. 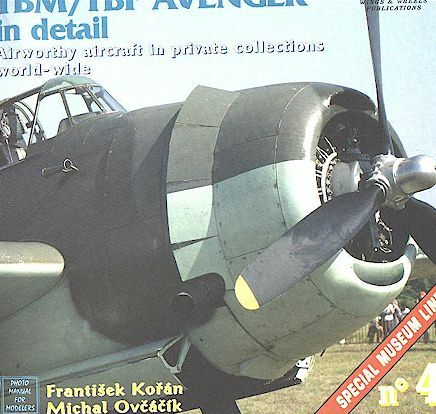 If as an aircraft modeller you wish to build one of several Avengers then look no further than this book for inspiration. I expect to see a lot of very complete models of the Avenger based on this book entered in the competitions this year. I would even go as far as to say aircraft restorers will use this book. This is truly a work of love and it is reflected in the completeness of the book. Once again the authors and publishers are to be congratulated on a museum quality reference book. I recommend it very highly go out and buy one now. It is a magnificent book.